You can cook, but can you grow? Sure enough, there will come a time and place when you will want (and maybe need) to learn how to produce your own food. This post is for those that are ready to take it to the next level despite not having the space that they may think they need. Living small or love for the environment makes people choose apartments over houses. This, however, also makes them miss their connection with nature. Since gardening is often associated with wide spaces and big plots, apartment dwellers assume they can’t start their own garden until they move to a bigger house. And here’s where they are wrong. One can start a garden, no matter how spacious or tiny their apartment is. Do you have window sills, balcony or a patio that receives five to six straight hours of sunlight? That’s all you need to experiment your green thumb. Put window boxes and clay pots on the floor, or start vertical gardening using trellises and hanging planters. Feel like re-purposing some old items? Discarded containers, empty glass or plastic bottles, a broken bench, an old shelf, or a rusty wheel barrow, make excellent planters. You can grow anything from herbs to perennial bushes on your balcony. Your plants must get five to six hours of sunlight. Too much heat or too little can destroy the plants. You might also be required to move them around or shade them when heat is intense. The choice of your pot depends on the plant that you are growing. Underground crops such as carrots and radishes require a deep pot. Herbs and salad leaves do not demand depth, but they do require width. So keep this in mind before sowing any seeds. The pot should also have good drainage at the bottom. This drains out excess water and maintains the right moisture level for soil. Since one of the reasons why people start their own gardens is to have access to chemical-free food, making your own compost is like adding cherry on top. Compost made from kitchen waste and garden scrap enriches the soil naturally. All you need is some green ingredients, brown ingredients, oxygen and water. Don’t be startled. These are ingredients already available to you, and that too conveniently. Green ingredients include kitchen waste such as fruit peels, used tea bags, and egg shells. Some other items are fresh grass clippings, and weeds. Your brown ingredients are branches, twigs, dry leaves and hedge clippings. Green ingredients being fresh and wet provide nitrogen to your compost. Brown ingredients, on the other hand, being old and dry act as carbon. 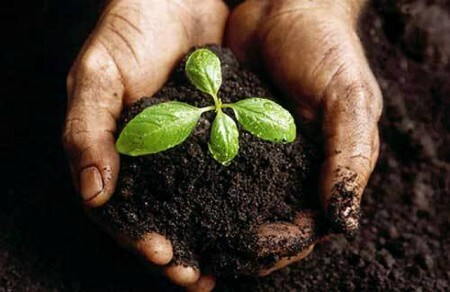 You add oxygen to your compost by tossing and turning green and brown ingredients. You can also purchase worms from a gardening store to speed up the decomposing process. When you prepare your compost bin, layer the bottom most layer with worms, but don’t overcrowd. Also ensure there’s good drainage or else your ingredients will attract moss. Then spread the green ingredients, sprinkling water on top. Cover it with a layer of brown ingredients. Gently pour more water. Repeat the steps until you have completely filled your compost bin. Cover the lid. Toss and turn every week to allow oxygen. Your compost should be ready within six weeks. Crops such as tomatoes, radishes, beets, garlic, lettuce, and basil give little trouble to first timers. If it is a flower garden that you are more interested in then start with sunflowers, marigold, sweet peas, nigella, aquilegias, nasturtium, Californian poppy, fuchsia and pansy. Plan how you want your flower garden to look like. Do you want bright flowers, fragrant ones, or those that don’t demand much attention? At my window sill, one container is holding herbs, other one has crops, and the third one is for the pleasure of eyes. I wake up to bright and fragrant jewels of nature. Starting a garden can overexcite you. That’s natural. I felt the same way. I planted six carrot seeds in one hole and when they sprouted they didn’t have enough space to grow. Eventually they died. It was a lesson well-learned for me. Do not overcrowd. Your plants need room to grow and nitrogen to live. When the planter is not spacious, plants fight among themselves for nutrients. Avoid it. Each plant has different requirements. You will have to read up on the distance between seeds, and how deep the hole should be before you begin planting. Some plants love growing tall. Is your balcony protected with a grill? In absence of a grill, place them next to a wall and fix a trellis. Plants will find their way to grow. You can also insert thin wooden sticks or cane inside the pot. Give them something to climb on. Watering plants can be tricky, as we tend to overdo it. Balcony plants do not require too much water. Water them early in the morning and around mid-day check the soil. If it is moist to the touch, your plants are well-watered. Another watering concern is source. You can either install a faucet on your balcony (which is not viable for many people), or carry a bucket. If you get self-watering containers, you save yourself a backache and also conserve water. Talking about conserving water, I know someone who uses AC condensate to water his plants. He gets up to four buckets every morning from the previous night’s air conditioning. Brilliant! Whether you are planning a garden to grow food or designing a place to sit and unwind, create a focal point. Place a small tree to add some privacy and extra color. Bushes such as camellia, tree rose, Japanese maple and crape myrtle are your best bets. They are small and thrive under sunlight. Keeping the basics in mind, do a little study on the plants you wish to grow. Understanding what they need will give them at least a chance to survive. As you start your garden, many surprise visitors will drop by. Place a water pot for them, if you can.